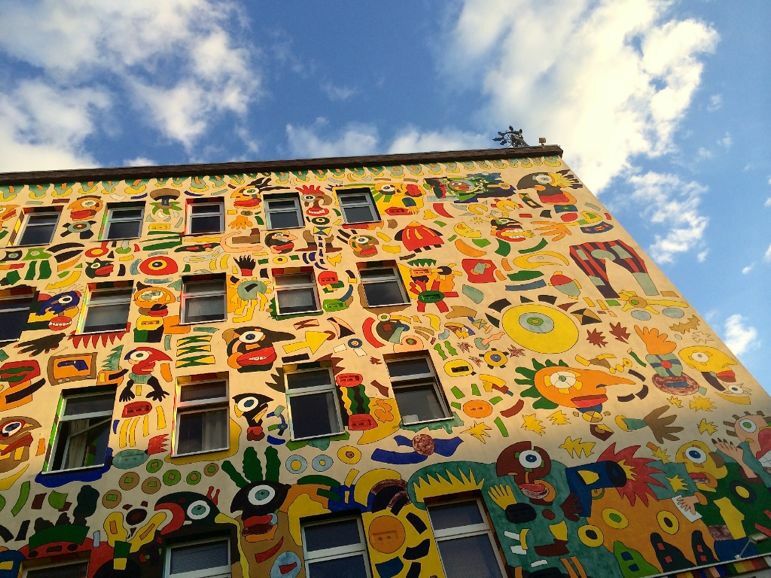 It’s a bold claim for a relatively small city, but the Eat The World walking tour of Leipzig was certainly one way to unearth its local characters and world view. 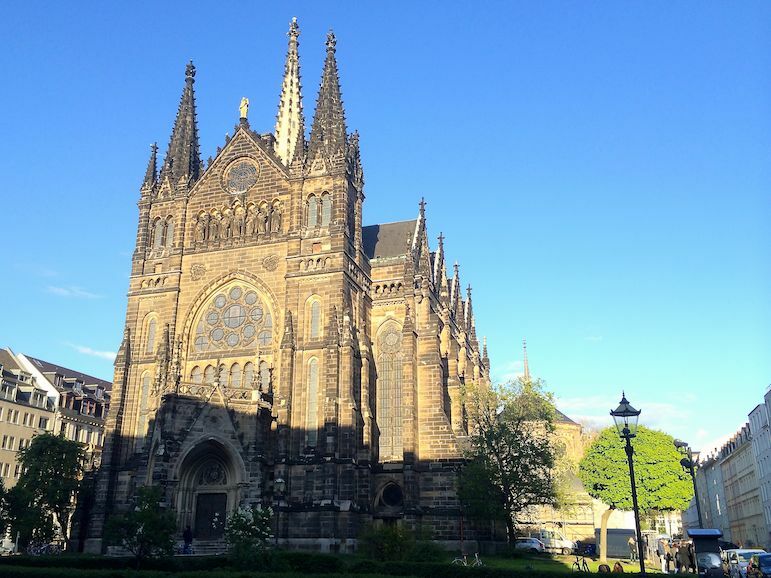 The portions of food were not substantial – we took a curtailed tour due to time commitments but the whole Eat the World walking tour of Leipzig includes an appetite quenching nine stops. But the walking tour was big on insights into this former East German city – home of the Peaceful Revolution of 25 years ago. We were welcomed on our tour by guide Dorothea. Our group gathered on the steps of the Reichsgericht, once Germany’s highest court, and where the trials took place of those accused of burning down the German Reichstag in 1933. Dorothea proved to be entertaining, well informed and personable as she led us on our walking tour of Leipzig and into a series of culinary delights. Our first stop was cupcake heaven, Mintastique. 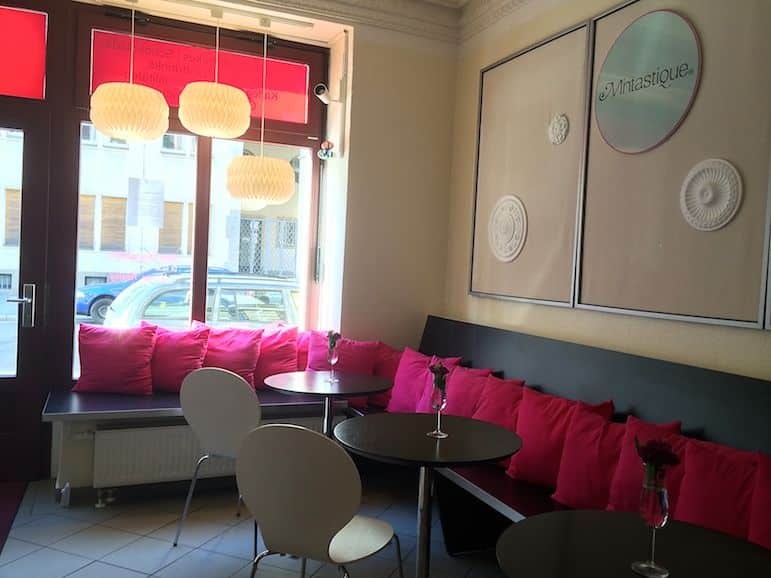 It serves top quality crepes, muffins and our favourite – cupcakes, we tried the chocolate and caramel one… delicious. 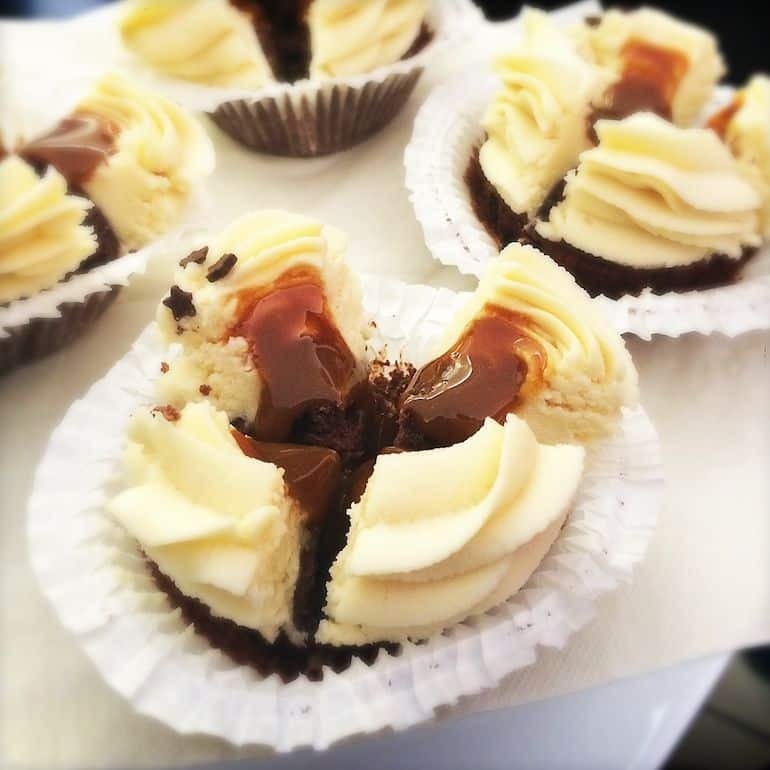 Mintastique’s co-0wner, Thomas Hillar founded Leipzig’s shrine to the cupcake after his wife who was working in London spotted the cupcake trend – people buying them with coffee to eat on the go. Our next stop on our walking tour of Leipzig was Con Wurze – a shop stocking herbs and spices from around the world, as well as some owner, Anna Scholz, blends herself. We tasted a variety on breads, and one mixed into butter. They were so good, especially her most popular blend Spaghettigewürz which is perfect for pasta dishes, we snapped some up to take home. As the walking tour of Leipzig unfolded we took in many of its sights, including St Peter’s Church, with the highest tower in the city. This early Gothic masterpiece also holds rock and pop concerts. Maybe the devil doesn’t have all the best tunes! The Fischer-Art House in Karl-Liebknecht-Straße, affectionately known as Karl-Li, was created by local artist Michael Fischer to protest the vacancy of this house, and now houses a 1980s-style cocktail bar, La Boum. 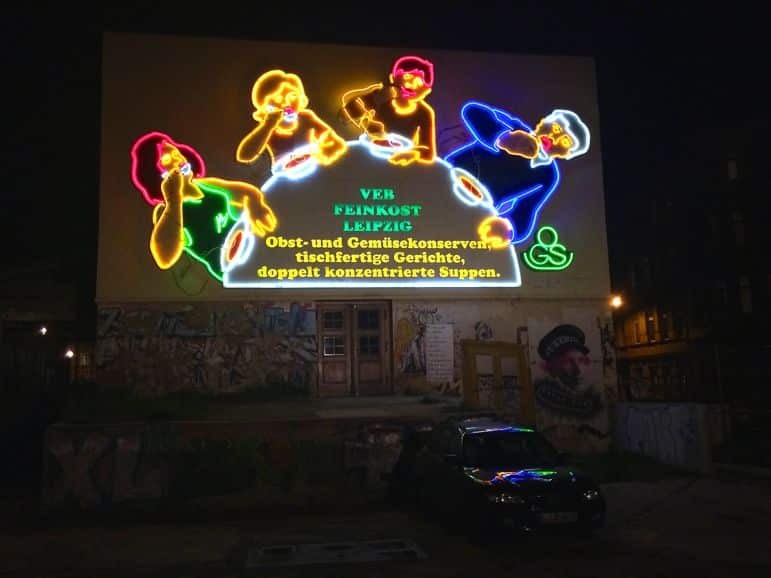 The famous Löffelfamilie or Spoon Family neon sign has been a feature of Leipzig since 1973. It adorns the wall of a former state-owned food manufacturer, which went by the snappy moniker of the East German People Owned Enterprise Delicatessen. 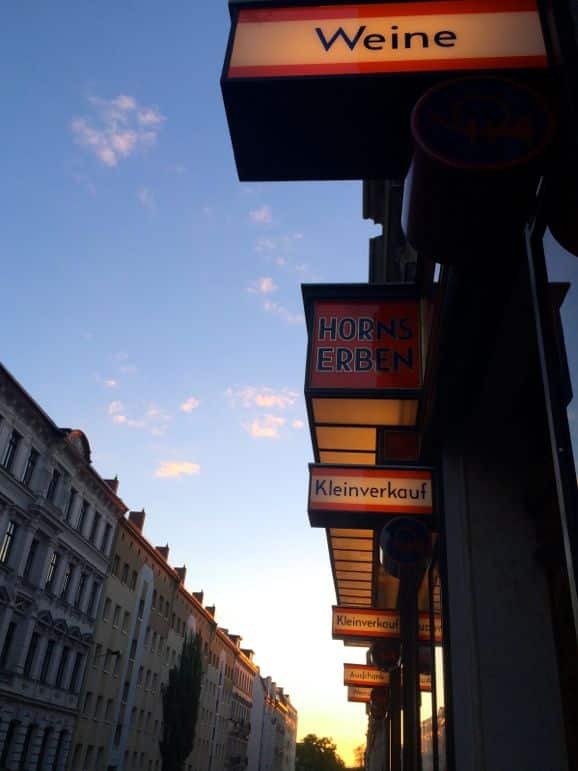 We finished the tour at Horns Erben, which serves up regional food. 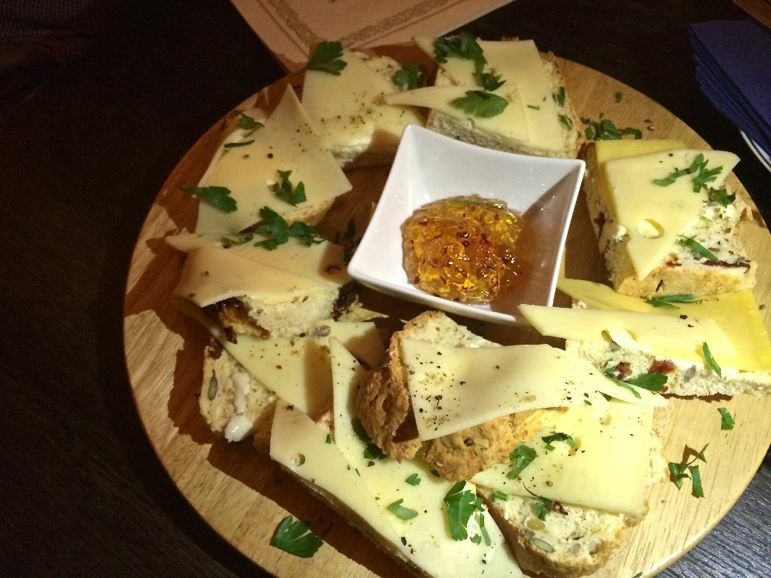 There we sampled its freshly baked house bread and local cheese with a quince and chilli marmalade, as well as typically local beers. 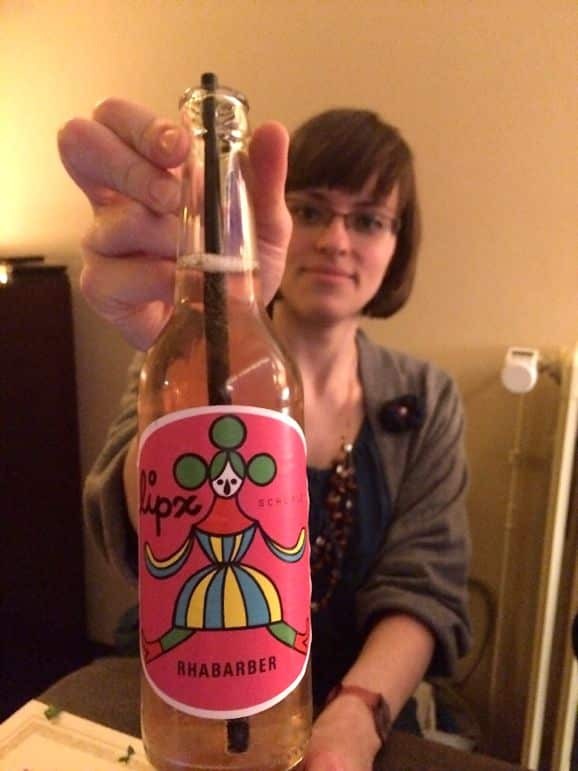 Here Dorothea shows us one of her favourite locally-produced drinks. Lipz is a fruit-based spritzer only available in these parts of eastern Germany. 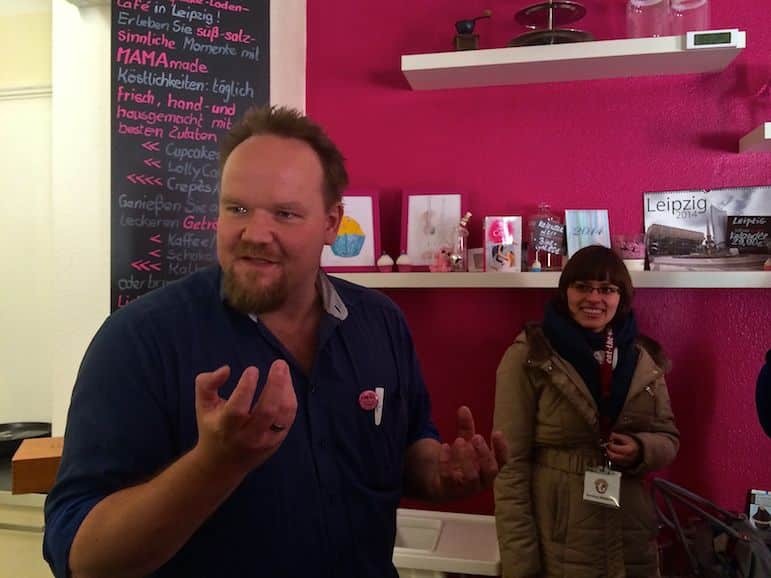 The Eat The World walking tour of Leipzig not only gives an insight into the culinary possibilities of the city, it provides a wealth of information about Leipzig, its people and history. You really can Jorg. In just a couple of short hours we’d seen (and eaten) quite a bit!